I read this article and found it very interesting, thought it might be something for you. The article is called #Notebandi Frontlines: Onion Rates Halve, Farmers Have No Cash, Can’t Go Cashless and is located at https://archive.indiaspend.com/cover-story/notebandi-frontlines-onion-rates-halve-farmers-have-no-cash-cant-go-cashless-50473. Onions, which were sold for Rs 1,000-1,200 per quintal in the weeks before demonetisation, are now sold for Rs 600-700 per quintal. 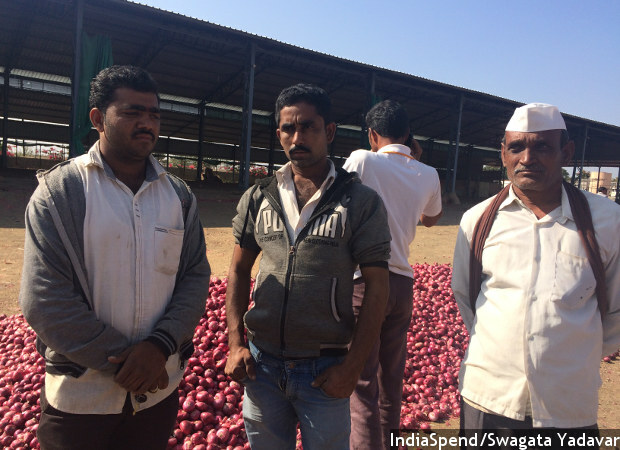 Onion farmers from Nashik district, Maharashtra’s onion belt, try to cope with mounting losses and problems due to cash crunch. Pimpalgaon/Lasalgaon, Nashik (Maharashtra): Prime Minister Narendra Modi would be happy with 26-year-old Deepak Patil, an onion farmer from the village of Valwadi in Malegaon Taluka, about 300 km north of Mumbai, India’s commercial capital. Patil, dressed in a grey jacket, over his white shirt and jeans, said he has a bank account, a cell phone, and receives payment for his onion produce in cheque. But Patil, who sells his produce in Pimpalgaon, a market in India’s onion heartland, Maharashtra–producing a third of all onions in the country–is not happy with demonetisation, or notebandi as it is colloquially called, and does not believe he can go cashless. After November 9, 2016, when notes of Rs 500 and Rs 1,000–86% by value of Indian currency in circulation–were declared invalid, the government pushed for cashless transactions and digital payments. Patil–with access to banking and a cell phone–could, in theory, move to cashless transactions, but in reality there is no Internet access where he lives, the closest ATM is at least 25 km away, the closest nationalised bank 15 km away, and the government has currently placed restrictions on the district cooperative bank that hosts his account. Nashik district, which contains Lasalgaon and Pimpalgaon, two of India’s busiest onion markets, contributes 10.4% of Maharashtra’s gross state domestic product, the highest of any agricultural district in the state, according to this 2014 Economic Survey report. Patil’s trials with the banking system, and the effect of demonetisation on the rural economy of Nashik, show how 800 million Indians, who depend on the rural economy, have been affected by the ban on notes over the last 35 days. The Reserve Bank of India (RBI) barred the bank where Patil’s account is–Nashik District Central Co-operative Bank (NDCC), and all other district central cooperative banks (DCCBs)–from exchanging defunct notes for Rs 100 notes or for new notes of Rs 500 and Rs 2,000. Patil deposited Rs 21,000 by cheque in his NDCC account, hoping he could withdraw some money to pay labourers who work on his farm, repay lenders and buy groceries–transactions that still take place in cash. “It takes more than two weeks for the cheque to be deposited,” said Patil. “All we can do till then is wait.” Even when the money was deposited in his account, it was no easy feat to withdraw it. Onion farmer Deepak Patil (centre) has a bank account, a cell phone, and accepts payments in cheque. 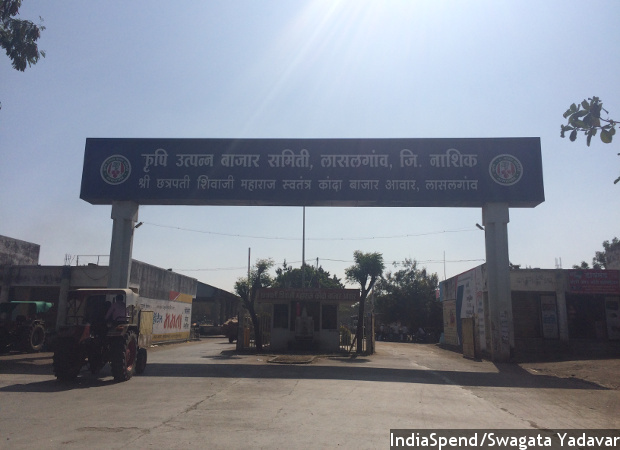 Patil could, in theory, move to cashless transactions, but in reality there is no Internet access where he lives, the closest ATM is at least 25 km away, the closest nationalised bank 15 km away, and the government has currently placed restrictions on the district cooperative bank that hosts his account. “I have to stand in line at the bank from 10 am to 6 pm, and all I get is one Rs 2,000 note,” said Patil, who doesn’t have any other bank account. He needed Rs 4,500 to pay labourers and Rs 4,000 for the mini truck that carries his produce to the market in Pimpalgaon, 100 km from his village. These days, he buys food on credit from the local grocer. Patil is one of many farmers who bank with district cooperative banks. As many as 371 such banks with over 140,000 branches across the country provide banking access to 2.5 million account holders, according to the 2015 annual report of the National Federation of State Co-operative Banks. “Seventy percent of farmers in Nashik district have their accounts with NDCC, and many have no other account,” said Shirish Kotwal, director and former chairman of NDCC. The RBI feared that district banks, which are not under the RBI’s purview, could be used to route black money back into the system, the Indian Express reported in December 2016. Seventy two hours after the announcement to demonetise Rs 500 and Rs 1,000 notes, DCCBs reported deposits of old currency eight times that of nationalised banks. Patil, the only earning member in a family of six, does not own a vehicle, and chose the closest bank for an account. The closest nationalised bank is 15 km from his village, the district cooperative bank 10 km. Like 83% of Indians who do not own a smartphone, Patil too does not have an Internet connection on his cell phone. So, even though he has a bank account, he cannot access Internet-based banking services. Mini truck after truck of red onions entered Lasalgaon onion market, the largest in Asia, as a sense of gloom pervaded the air. Farmers huddled in corners as traders decided the price of onions at auctions. “Ever since notebandi, the rates have decreased by half,” Patil said. Onions, which were sold for Rs 1,000-1,200 per quintal (100 kg) in the weeks before notebandi, are now sold for Rs 600-700 per quintal. There were no auctions for ten days after demonetisation because of a lack of valid notes in the market. Onions stored in the market stayed unsold and when markets reopened, new produce flooded the market reducing onion prices. Farmers have no choice but to sell the red onion at whatever price it sells, as it does not last beyond 10 days, unlike the lighter coloured ‘unhal’ onion that can be stored for three months. Madhavrao Thorat, another marginal farmer, has no time to spare to stand in the lines outside banks as he is sowing onions in his field, in the village of Devgaon, more than 200 km north of Mumbai. The nearest nationalised bank is 8 km away, and the nearest ATM 15 km away. He has not been able to pay his labourers because of a lack of cash. Madhavrao Thorat, a marginal farmer, has no time to spare to stand in the lines outside banks as he is sowing onions in his field, in the village of Devgaon, more than 200 km north of Mumbai. Prices have further fallen because of excessive onion production, a consequence of the good monsoon this year. A drop in prices particularly hits marginal and small farmers, who, like Patil, own less than two hectares, or 4.94 acres of land. 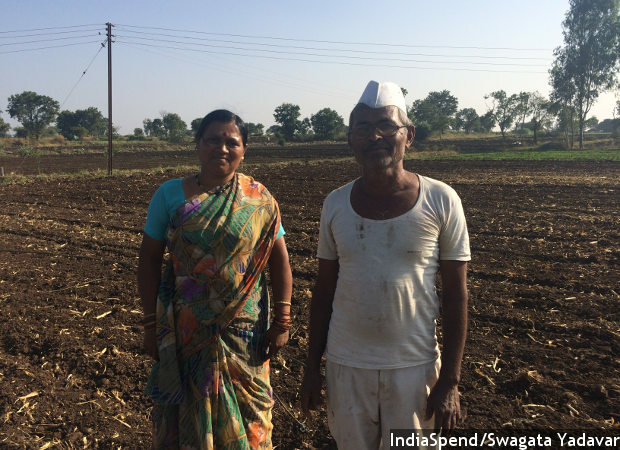 These farmers own 78.6% of all land holdings in Maharashtra. 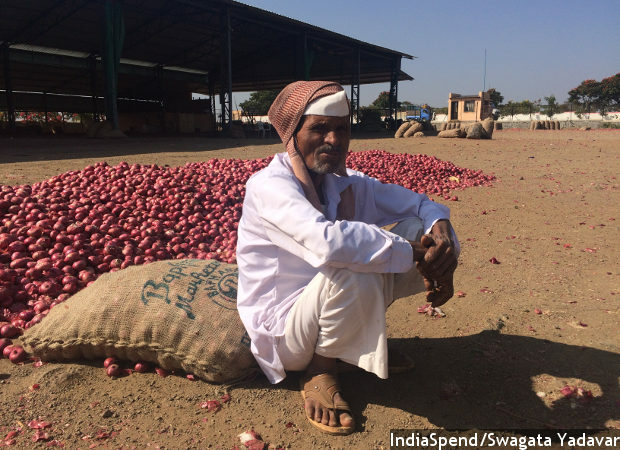 Patil, who owns four acres of land which he farms with his brothers, has made a loss of Rs 30,000 because of low onion prices. “Farming for small farmers like us has become unaffordable,” he said. In 2015, onion farmers from districts around Nashik brought 0.4 million metric tonne of onions to the agricultural market in Lasalgoan–called an Agricultural Produce Market Committee (APMC)–between April and August. Onions brought rose 150% to 1 million metric tonne, over the same period in 2016, according to the Lasalgaon APMC. Lasalgaon Agricultural Produce Market Committee is Asia’s biggest onion market, and most Indian onion is exported from this market. Onions brought rose 150% to 1 million metric tonne, between April and August, 2016, compared to the same period last year–further reducing onion prices. “There has also been enough production of onions in Haryana and Karnataka which has led to a further drop in demand and prices,” said N S Vadhavne, an accountant at Lasalgaon APMC. Profits from agriculture have been declining as costs have tripled over the last few years, IndiaSpend reported in March 2016. Coupled with a crash crunch due to demonetisation, and falling prices, Patil is ready to quit. “Given a choice, I would like to find a job and migrate. Farming is a loss-making business,” said Patil, who enrolled in college, but never completed his bachelor in arts degree. His wife has a diploma in education, but no job. For our continuing coverage of #notebandi see “Currency Chaos”. Here are some facts the survey team may not be aware of. People like Patil, who live in remote areas, travel by bus or motorcycle to nearby towns regularly in connection with farming-related chores – buying fertilisers, attending to pump repairs, paying electricity bills or getting medical treatment. Hence, going to nearby towns for getting funds and spending some time in the queue will not be such an arduous task for him, especially when many of them spend much longer time in the district offices and courts on various disputes. Co-operative banks have been allowed to disburse crop loan up to Rs 25,000 per week. He can definitely manage his commitments. As such, till December 12, old notes were being accepted in petrol pumps. Electricity bills and govt taxes could be paid with old notes. Till December 30, he can pay his labor in old notes and they can exchange in banks, which is fortunately only 20 kms away. Labourers, after receiving the payments, spend a lot of time in town doing their monthly shopping. As far as mobile and internet connectivity goes, IndiaSpend has strangely not advised Patil that mobile banking through SMS does not need internet. As a matter of fact, Patil and co would have suffered in the past due to nature’s vagaries like untimely rain, cyclone, flood etc etc. Only a few months back, onions were being burnt and destroyed as the prices had dropped so much that one incurred loss even in transporting them to the markets. The dichotomy in the farmers stand is very baffling: they lament that agriculture is no more viable but still fall in to wrong advise of vested interests in refusing to sell their land for lucrative price. Lastly, the IndiaSpend team is blissfully ignorant or purposefully turning their blind eye on two major aspects. The farmers have their own circuit of sourcing loans from money lenders. In some cases, many of them have been devastated by the so-called co-operative banks going bust. Lastly, the Modi govt has brought in an insurance scheme to minimize his losses, which I am sure would not have figured in the survey carried out. Why is there so much obsession to prove PM wrong? If PM does not act against black money, he is accused of playing politics of rhetoric. The authors will chide about his 56″ chest. Now, when he has acted, he is criticised for not having done enough planning. No amount of planning can be considered as adequate planning on such issues. After all, one of the main objective is to maintain a level of secrecy, and that is not possible when you do minute planning. Stress on e and digitisation need not mean cashless economy totally; it could also mean less-cash economy. Why so much compulsive obsession to take on Modi initiatives? Is there a personal agenda?